Are you the type of woman who gives your all to everyone: crushing it at your job, being kind, never hurting a fly… but while giving to others, you’re not giving to yourself? Do your health goals (clearing acne, losing weight, getting energy back) feel like a war? Have you been brushed off by your dermatologist or doctor because your struggles can’t be “diagnosed?" You’re HUSTLING, but nothing changes. You try to go it alone - spending a ton of money, wasting time researching online only to get down a rabbit hole hours later. 1. That used to be me... (ugh!). 2. Most of my clients had been dealing with this same situation to lose weight, clear acne, get rid of headaches and fight chronic fatigue. If you’re reading this and thinking, “YES, that’s what I need right now!” here are seven benefits of joining a group health coaching program. A group program gives you the opportunity to share your feelings with others and develop deeper connections, making our weekly Skype sessions meaningful. Knowing you're not alone in your journey is actually an early human survival tactic (we need each other for willpower!) and help you develop confidence to address your challenges and yes, actually succeed! You’re much more likely to stick to your gym routine if you have a gym buddy, right? This is true with group coaching. When women are part of a TRIBE, they procrastinate less, accomplish more, and reach their goals faster. Together, we’ll uncover solutions and you may not have discovered working solo. Have you ever been in a study group and learned from a classmate who just gets it? Other group members help you master new concepts and habits like a pro! Ever get a precious piece of advice from a really honest girlfriend that you just couldn’t see on your own? It’s like that. When you work alone, you examine situations from one perspective – yours. But when you work in a group, you’re exposed to a variety of insights to see a situation from different angles and motivate you to develop new solutions. Get the same quality coaching, but at a fraction of the cost of 1x1 coaching. Group coaching is a smart and affordable way to receive quality guidance. When you work in a group, the whole team celebrates your success. Just like when a player on a sports team scores a goal - the entire team celebrates! It’s more fun to go out to dinner with your girlfriends than by yourself, right? Working with a group (even online!) is a social event that we all look forward to. You’ll join a close-knit group who’s energizing, kind, motivating and most of all – fun! Interested in joining a group health coaching program? 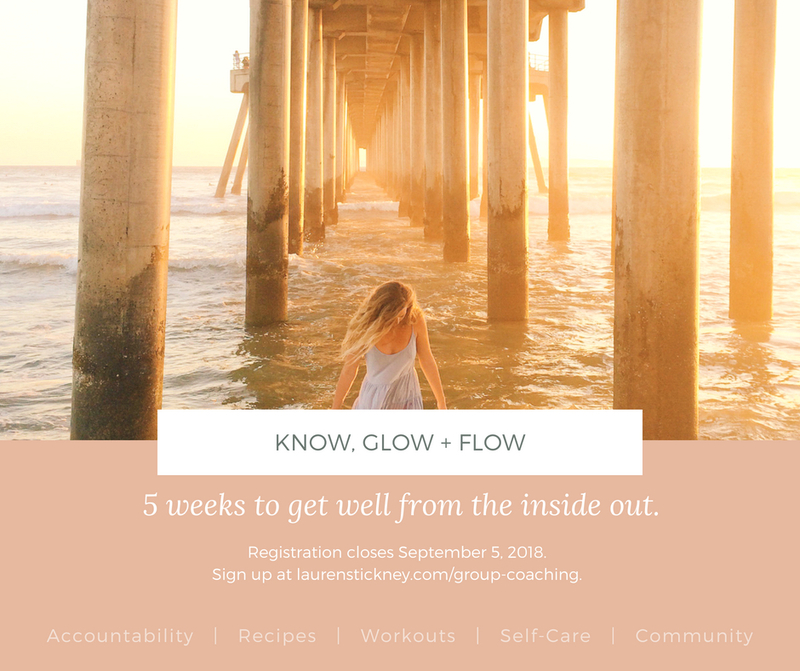 Know, Glow + Flow registration is now open and limited spots remain. Click here to learn more and register.